Majestic brushes feature synthetic filaments that deliver smooth, even strokes. Their lightweight feel, excellent color-holding capacity, durability, and snap make them a favorite among artists. Majestic brushes are ideal for watercolor and acrylic painting. Angular, Set of 7 — The set includes one each of sizes 1/8", 1/4", 3/8", 1/2", 5/8", 3/4", and 1". 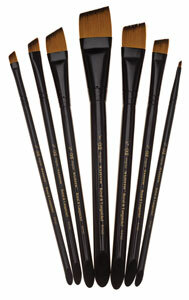 Shader/Wash, Set of 8 — The set includes one each of sizes 4, 6, 8, 10, 12, 1/2", 3/4", and 1". Filbert/Wash, Set of 7 — The set includes one each of sizes 4, 6, 8, 10, 12, 3/4", and 1". ® Royal & Langnickel is a registered trademark.